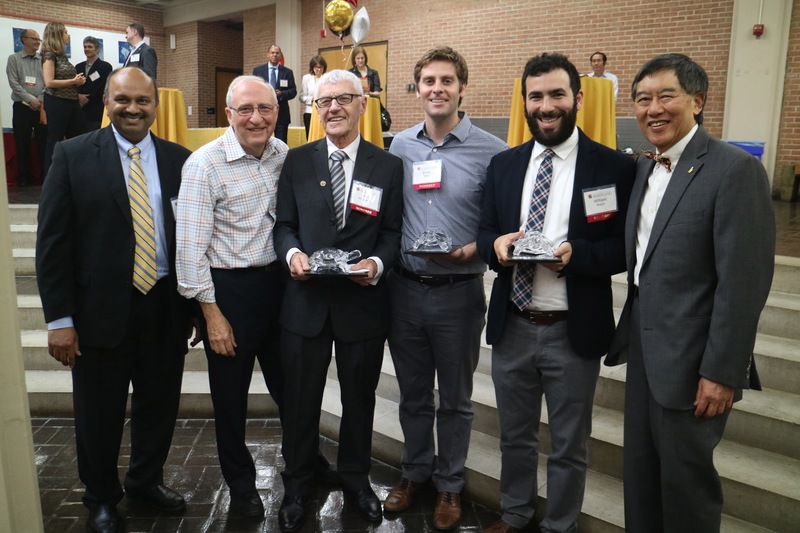 L-R: Interim Vice President for Research Amitabh Varshney, Ben Shneiderman, Arie Kruglanski, Evan Starr, William Robin, and President Wallace Loh. On Friday, April 28, the University of Maryland (UMD) Division of Research held its 10th Annual Celebration of Scholarship & Research Reception in the Parren Mitchell Art-Sociology Building atrium. Co-hosted by the Office of the Provost, the celebration honored the excellent research and scholarly contributions of the university’s faculty over the last year. UMD broke its own record of external research funding for the second year in a row in fiscal year 2016, obtaining $560 million. The number of scholarly articles published by university faculty has also increased, with over 4,800 articles published since January 2016. Since 2015, the Division of Research has recognized faculty who take a proactive approach to sharing their research or opinions on research issues and policies with the public, bestowing upon them the annual Research Communicator Impact Award. Faculty are nominated in three categories: op-ed, new media, and faculty cited in media, and the winners of the 2017 Research Communicator Impact Award were announced at the Celebration of Scholarship and Research. The winner of op-ed category was Assistant Professor William Robin of the Department of Musicology at the College of Arts and Humanities for his piece in The New Yorker, “Colin Kaepernick and the Radical Uses of the 'Star‑Spangled Banner. '” The article discusses the history of the “Star-Spangled Banner” and argues that it has been used as an anthem of dissent since its creation. Distinguished University Professor Arie Kruglanski of the Department of Psychology at the College of Behavioral and Social Sciences won in the new media category for his op-documentary featured in the New York Times, “The Price of Certainty.” The documentary discusses his theory of “cognitive closure,” which proposes that people close their minds to new information about a topic once they form a decision about it. The winner in the faculty cited in the media category was Assistant Professor Evan Starr of the Department of Management and Organization and the Ed Snider Center for Enterprise and Markets at the Robert H. Smith School of Business. Starr’s working paper entitled, “Noncompetes in the U.S. Labor Force,” was referenced by a variety of media outlets including NPR, Wall Street Journal, and the New York Times for articles about non-compete agreements and their impact on low-wage workers. Distinguished University Professor and founding director of the Human-Computer Interaction Lab Ben Shneiderman was also recognized for his lifetime contributions to research communication at UMD. Shneiderman championed inception of the Research Communicator Impact Award and has strongly advocated communicating research to the public through news media and social media. More than 25 faculty submissions were received for the 2017 Research Communicator Impact Award, representing disciplines in eight of the university’s 12 colleges and schools. Learn more about the Research Communicator Impact Award.